Sometimes, you may end up with two tickets for the same issue (e.g., because a customer sent you a brand new email instead of replying to an existing thread). In such cases, you may want to merge those tickets into one. 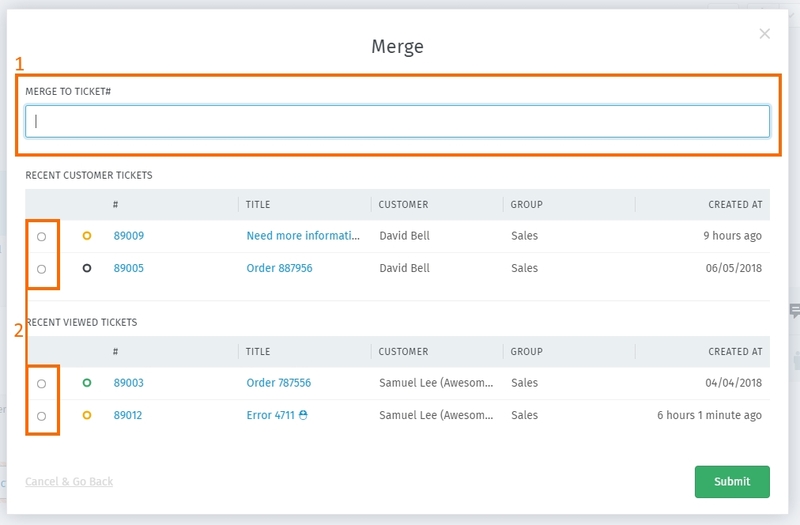 To merge a ticket, access the Ticket ▾ submenu in the ticket pane. Merging a ticket migrates all messages and notes out of the original and into the selected one. That is, if you 1) access the merge dialog from Ticket A, and then 2) select Ticket B in the merge dialog (see below), then Ticket A will be emptied, closed, and linked as a child of Ticket B. The merge dialog. Specify a ticket to merge into by ID (1), or select one from the list (2).